What’s the best bike to learn on? One of the most daunting challenges to folks wanting to get into Dual Sport or Dirt Bike riding is buying the right motorcycle. No matter what you buy, it means spending some of your hard earned dollars! I have no affiliation with any specific brand or motorcycle. My sole purpose is to help people have fun and be safe. I’ve noticed a seemingly testosterone driven trend toward “bigger is better.” My view is its most important for the motorcycle to fit you! I don’t care what anyone else is riding. The motorcycle must fit the rider! For those who are inseam challenged, there are more limited yet also very good options. My first question is, “What will you be riding?” Single track trails in the woods? Dirt roads that require a street legal motorcycle? Adventure touring which demands longer fuel ranges and luggage capacity? If the answer is “I don’t know!” Relax. Lots of riders start from here! I really like smaller street legal dual sport motorcycles like Yamaha’s XT250, TW200, Honda CRF250L, Suzuki DR 200, Kawasaki KLX 250S etc. for smaller statured riders. Larger riders might consider Yamaha WR250R, Suzuki DR400, DR650, Kawasaki KLR650, and Honda XR650L. European manufactures such as BMW and KTM also have very nice options. Currently I own a BMW F800GS and KTM 350XCFW. These bikes are quite a bit more sophisticated and expensive than the models listed above. The less expensive models will do everything mine will do, cost less, can often be found at a reasonable price used, and if they’re air cooled, they are lighter in weight! All good things for a new rider who’s just learning plus they’re street legal! I’ve been riding dirt bikes over 40 years. 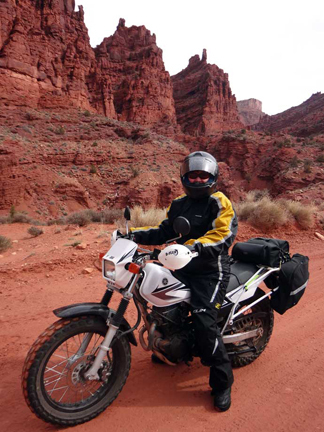 Yet, when I decided I wanted to try my hand at Adventure Riding, I purchased one of the bikes listed above used for $3600, tried it out for 6 months, discovered I loved ADV Riding, and evaluated what I liked about the motorcycle and what I found lacking. I sold that bike for $3400 and then bought my “dream bike” which ran over $15,000! The lesson is, rather than drop huge dollars on what you THINK is your dream bike, buy something reasonable, ride it, crash it (yes, you will! ), decide what you like, sell it to someone else who’s also learning, and then go get what you KNOW you want. Most of the smaller displacement motorcycles (200-250cc) will have a top highway cruising speed of about 60mph. The exception is the Yamaha WR250R which easily runs 80 plus mph, but it’s also a very tall motorcycle not suited for short riders. People have literally ridden these little motorcycles around the world. Just know, you’ll travel at a more leisurely pace. I once saw a TW200 for sale that was decked out with all kinds of luggage and had less than 400 miles on it. The salesmen convinced this senior husband and wife that they could cruise 65-70mph riding two up! These small bikes are awesome to learn on, forgiving, and light weight. They’re fuel capacity limits them to about 100 miles per tank so you might need to carry auxiliary fuel bottles. You’ll also want to consider lighter soft luggage on these bikes as the rear sub frame isn’t designed to carry super heavy gear. The 650cc motorcycles listed above are considered “mid-size” dual sports. They easily cruise at 80 plus mph, have a bit longer fuel ranges (closer to 150-200 miles), and the rear sub frame is capable of carrying more weight. These bikes are often referred to as “Zombie Apocalypse” motorcycles because their simple, air cooled, carbureted motors are easy to work on and parts are available worldwide. Rear suspension on these bikes is usually some type of linkage system which can be changed to lower the motorcycle. Usually dropping the back end via linkage, also means raising the front forks through the triple clamps which effectively lowers the front end of the motorcycle. A word of caution, just cause you can, doesn’t mean you should! I once rode one of these motorcycles that had been lowered a full 3 inches. It handled poorly, was awkward, and felt quite dangerous to me! The street legal dual sports I’ve suggested aren’t the best choice if you intend to ride only single track trails. There are better more dirt oriented smaller single track bikes available. 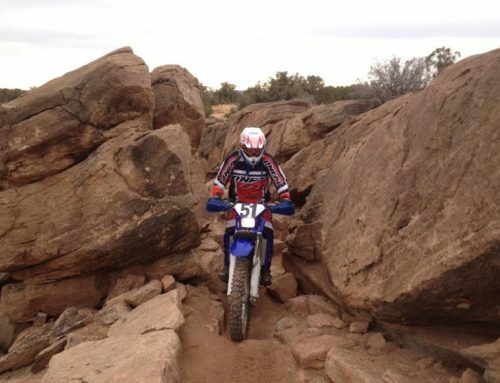 Dual sports are the “jack of all trades.” A dedicated single track motorcycle will be lighter, often times will not have lights, suspension is better, and power delivery is usually more abrupt. But, that’s enough for now. This is a different conversation! Please also be aware, we offer fee based services that include assisting clients in purchasing the right motorcycle. If you have specific questions or skills you’d like me to cover, please reach out to me at www.advwoman.com. Ride safe and Have Fun!